Andrew Jackson Higgins, the founder of Higgins Industries who built more than 20,000 boats, many of which would come to be known simply as “Higgins boats,” knew that he could not accomplish the impossible without the workers. Over the course of WWII, Higgins employed more than 20,000 individuals. Training was an essential part of his program, as was worker involvement and motivation. Like his contemporary, the legendary Henry Kaiser, Higgins was a fan of athletic industrialism. Pitting teams of workers against one another in production competition often resulted in quicker work. There were contests amongst the workers for everything imaginable—ships constructed, blood donated, bonds raised, and slogans created. Higgins Industries shop floor. Courtesy of The National WWII Museum. The Vol. 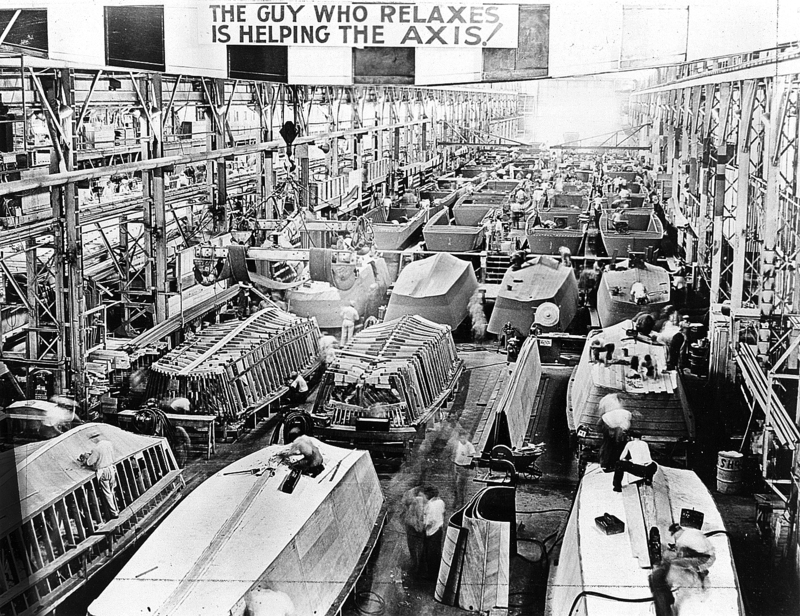 1, No.2 issue of The Eureka News Bulletin, Higgins Industries’ company newsletter, dated February 1942, featured a story which sheds light on the birth of the Higgins shop floor rally cry, “The Guy Who Relaxes is Helping the Axis.” Employee George Vanney submitted the slogan, which would live on in photos like the one above. The Eureka News Bulletin and The Higgins Worker are full of such patriotic slogans and poems, many submitted by employees just like Vanney. Article from The Eureka News Bulletin. Courtesy of The National WWII Museum.